Listen to the Waves Crash from Every Room in this Relaxing Gulf Front Condo! Open the door to Costa del Sol C3 and unlock the secret to a truly relaxing vacation- staying in a real-life ‘sand castle’! 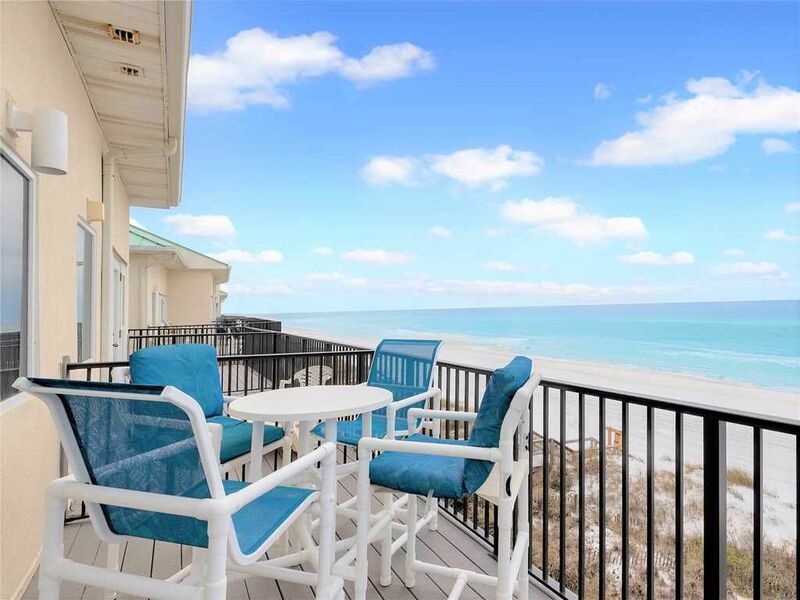 This Destin vacation rental is so close to the emerald shores of the Gulf of Mexico that the sound of the crashing waves permeates each floor of this sparkling clean vacation home. Whether you are making that morning cup of coffee in the renovated kitchen with beautiful granite countertops, watching a movie on the giant flat screen TV in the newly tiled living room or sleeping soundly in one of the roomy bedrooms- the soothing tones of the Gulf will be your constant companion. Not only is Costa del Sol directly on the beach near to restaurants, shops and golf courses but it also has the rare amenity of having three private beachfront decks. Have a cookout on the first deck as the sun sets brilliantly over the aqua waters, get some sunshine on the middle deck while pelicans float by or watch the moonlight dance across the water’s surface from the top deck. The picturesque exterior of Costa del Sol C3 is complemented by a convenient interior. A washer and dryer, a fully stocked kitchen and flat screen TVs in each room combine to make this the most comfortable ‘sand castle’ you’ve ever stayed in. This townhome requires a 7 night Saturday to Saturday stay during Spring Break and Summer. There is a 4 night requirement during the off seasons. Great place to stay. Plenty of room and a few steps to sand! Check in and out was so easy and the management staff absolutely excellent, I can’t say enough about how friendly the office personnel were to work with. We hope to keep returning yearly. We had a wonderful time. The condo was great. The free umbrella and chairs along with the free golf made it even better. We will be back next spring and fall. Expect to hear from us. The greeting when we checked was the best ever. Very nice property! Right on the beach, very clean, beautiful view! My family and I vacation in Destin every year and this property was up to par. Enjoyed another year and already looking forward to next year! Clean nice and right on the beach. Loved the bedroom and balcony ..left door open to listen to waves at night. Great location. The location, wonderful! It needs updating, the furniture is nasty, needs cleaning! I put a sheet over the recliner to hide the dirty stains. We would not stay here again unless it was renovated. Thank you for your recent review of Costa Del Sol C3. We're glad you enjoyed the location and hope you had a great time during your visit to the beach. We're sorry to hear that this townhome did not meet your expectations. We have shared your feedback with the property manager and the owner so they may work together on improvements. Please keep us in mind for your next beach vacation and we can explore other options for you and your family. The location could not be better. Unfortunately we spent several days waiting for items to be fixed. One night we dealt with the upstairs toilet and tub being stopped up and not draining. The next night the air froze up and it started getting hot. Then water started leaking from the ceiling because of the ac. We had one night of no issues and then the upstairs toilet started leaking and water was coming downstairs from the light fixtures, vents and ceiling itself. Let me say, they did a great job of coming every time we called, but judging from the ceiling and walls, this happens more often than it should. Thank you for taking the time to review Costa Del Sol C3. We are glad you enjoyed the great location of this vacation rental. Nothing is better than waking up to the beautiful emerald waters and sugar white sand. We are disappointed you had so many issues during your stay, but are glad we were able to be responsive to each one of them. Being a Gulf-front rental, AC units will freeze up easily if the doors are opened frequently allowing warm Gulf air to enter. We have not had plumbing issues in the past and hope you understand this is not a common occurrence. Newman-Dailey has a wide selection of rentals both on and off the beach and hope you will consider staying with Newman-Dailey again in the future. We were delighted to have you as our guests and hope to welcome you back to the beach soon.